Fix your sprinkler system . . .
so you can shut it off! Every few years the South Florida Water Management District imposes mandatory water use restrictions during periods of water shortage. This affects everybody who waters the landscape. For example, during Phase I Water-use Restrictions, residential users are permitted to water their lawns and landscapes from 4-8 a.m. on Mondays, Wednesdays, and Saturdays for homes with addresses that end with an odd number, and Tuesdays, Thursdays, and Sundays for homes that end with an even number. Your landscape can easily survive Phase I and even more stringent water-use restrictions, assuming you can supply the water it needs during a shortened interval. The problem is that most sprinkler systems are very inefficient. They work poorly during normal periods, but nobody notices because it's probably raining when the system is running. Come the drought, and the typical South Florida landscape consists of "Islands in the Stream," round green islands of healthy grass surrounded by brown wilted turf. If the water management district says that you can only water for a few hours on certain days, don't you want your sprinkler system to actual work? 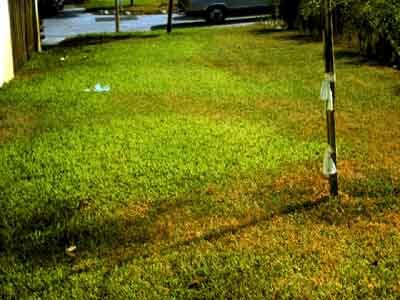 The majority of the sprinkler systems in South Florida suffer from inadequate distribution uniformity. Poor distribution uniformity means that some parts of the lawn receive essentially no water and the sprinkler system must be run several times longer than if it were working properly to provide a little water to all corners. In a survey of 211 lawn sprinkler systems, by the Mobile Irrigation Lab at the South Dade Soil and Water Conservation District, 85% of lawns were reported to have a distribution uniformity of less than 70%. According to the Mobile Irrigation Lab, the majority of irrigation problems are maintenance related, not design problems, and the list includes blocked water streams, mixed sprinkler sizes and clogged emitters. With nothing more complicated than a tune-up, the vast majority of home irrigation system can generate large savings in irrigation use. 1. Test your system ("catchment can" test). Scatter 20-30 drink cups or coffee cans throughout the landscape, run the zone for a defined period, e.g., 10 minutes, and measure the amount in each cup. The results will tell you how long you must irrigate, and will pinpoint problem areas for maintenance or redesign. Periodically re-test your sprinkler system, inspect spray patterns, and ensure uniformity of watering by providing overlap with head-to-head coverage. 2. Clean out clogged sprinkler emitters, and remove obstacles and low overhanging branches that block stream flow. Raise any sprinkler heads that do not clear the turf canopy, or use popups. Replace any heads and fittings that are broken or cracked. Use partial (half- or quarter-circle) heads to replace full-circle heads that overspray onto the street or buildings. Consider adding heads in areas that do not receive enough water. The solution to dry spots is to fix the irrigation in that zone, and not to over-water the rest of your property to compensate for poor coverage. 3. Lay out irrigation systems efficiently to attain high uniformity. Use sufficiently large pipe size to keep pressure losses at a minimum, and to help achieve uniformity. Establish separate zones for turf and ornamental plants. Place rotary heads and spray heads in separate zones. Make sure that all sprinklers are placed as closely as recommended in manufacturers' specifications. This normally requires that the radius covered by one sprinkler head should just barely reach the adjoining sprinkler heads, that is, they will completely overlap.